Please note that the following is a personal review by respected WWM crewmember James 'Salty Dog' Gasta. His opinions are his own and not those of WetWebMedia and should not be taken as any kind of promotion or endorsement. 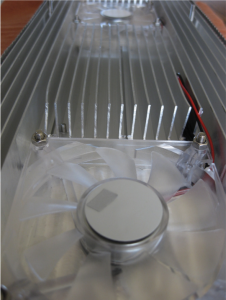 The power supply is a constant current device and is enclosed within an aluminum housing employing one 3" cooling fan to ensure a low operating temperature for the electrical components. The unit measures 12 Â¾" x 5 Â¾" x 2 Â¾". Orphek chose to go with the more expensive constant current power supply because regardless of type, size, or power, all LEDs work best when driven with a constant current source power supply as LED color will change with small variations in driving current. As with the power supply, the LED module is equally well made using a combination of Corsica-coated stainless steel and acrylic materials. The sides are wrapped in the stainless sandwiched between a clear 3/8" thick acrylic lens and a white acrylic back. The clear lens effectively protects the LEDs from any moisture contamination. 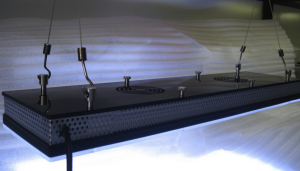 The LED module contains two 3" cooling fans that effectively cool the LED semiconductors by blowing air across a massive heat sink and out through the perforated side vents in the module. As with all semiconductors, cooler operating temperatures greatly extend the useful life of these components. 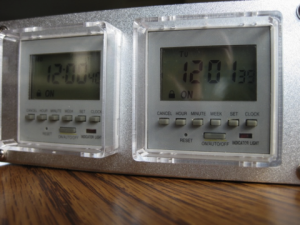 The module measures 24" x 6 Â¼" x 2". Removing the white acrylic top cover revealed how large the aluminum heat sink actually is, it covers the entire length and width of the module. All hardware used for the module assembly is made of high grade stainless steel. The Orphek-lit part of the tank (see photo on the next page) appears to be dimmer than the halide and that is because the pendant was resting on acrylic straps very close to the water's surface when this photo was taken. Because of its design, and the sharp focusing of the optical lenses, the pendant must be hung and adjusted to effectively spread the light across the width of the tank. The hardware and cables used for hanging the module are included. The combined LEDs offer a full spectral profile of 400nm-760nm which means there is no color loss throughout the entire spectrum, a downside commonly associated with other brands of LEDs. Each LED is outfitted with a 90 degree optical quality lens which greatly reduces water surface refraction and reflection. On 10/31/10, Orphek has introduced the PR-156W LED Module. This module is identical to the PR-156 but uses frosted 120 degree reflectors rather than the 90 degree clear reflectors used in the PR-156 which was designed for up to 40" of water penetration. The PR-156W is best used on aquariums 28" or shallower, (and for those with canopies without a lot of clearance) and will be more economical for those needing spread rather than punch. With an average etailer price of $850.00, this light is not going to appeal to everyone's needs. 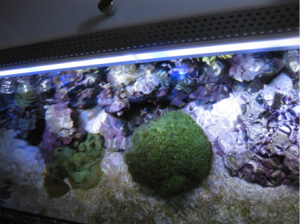 Hobbyists with shallow tanks (<18") can find more affordable LED systems capable of doing the job. For those with deeper tanks, you will be hard pressed to find another LED system capable of producing the higher PAR levels required. Orphek offers a one year warranty on the power supply and associated electronics, and a three year warranty on the diodes. In the very unlikely event of a component failure, Orphek will provide a new unit and have the defective unit returned in its box so the aquarist isn't without lighting. Now this is a warranty I can live with. Although the PR-156 is claimed to replace a 400 watt MH lamp, the comparison was made with a 350 watt MH system. As you can see, the energy savings is very respectable compared to the 350 watt MH system. Based on my energy provider's rate of 10.24 cents per kilowatt hour, the Orphek PR-156 energy cost came in at $3.68 per month based on a daily 10 hour photoperiod, while the MH system cost $11.36 per month, and this does not reflect bulb replacement costs, and water cooling devices such as fans or chillers. improved color. He said I should receive the very first sample to review in a couple of days. It is. I'm honored that they asked me if I'd like to review it. The review was very well done. I completely agree on the overkill of the amount of programs possible, but variety is the spice of life they say. Once I figured it out, it was easy. We also had some problems with the controllers. We're still waiting second time around, for a replacement. On one of the controllers the backlight was very dim, and the moonlights weren't working. We actually bought four units, two with the UV lights and two regular. Out of the four, we've had problems with two of them. Two controllers weren't working and a light was damaged. All has been settled except one controller that we're waiting for. The moonlights weren't working. The vendor from which we purchased the lights contacted the owner of Orphek, Ofir, who in turn contacted us to let us know that sometimes during shipping the timer groover jumps out. We should take it out and put it back in. He said it may be that or the driver. We could have checked this but my husband had already sent the last unit that still wasn't working back via UPS to the retailer we bought it from so we're still waiting for the replacement. 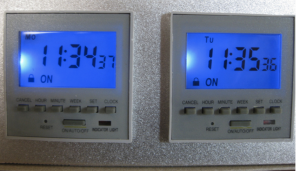 As of now, three of the units are working great. All that being said, it is a hassle to have problems like this with such expensive equipment, however, they are under warranty, and things happen. I'm sure once we get the last controller back, we are going to be happy with our choice. The lighting is just stunning, and the moonlights are breathtaking. I could watch the shimmer for quite some time with no livestock in the tank. 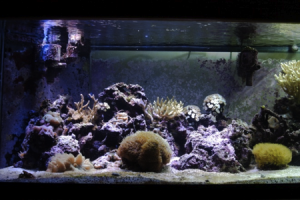 Thank you for the tips on acclimating the corals and nitrate education as well. I really appreciate it. Enjoy the rest of your weekend. Weird how that query disappeared, isn't it. As to the Orphek PR-156. Yes, it's plenty intense enough to grow anything at that depth. But with the standard reflectors, I doubt if you would get enough light spread. If you plan on getting one of those, order the model with the 120 degree reflectors (PR-156W). They incorporate a honeycomb type of reflector that spreads the light a little better but with a little PAR loss. In your depth tank, I really doubt it would be a problem. The standard model has 90 degree reflectors. I'd email them before emptying your wallet just to be sure. You can email Douglas at usa@orphek.com. You may also want to look at the Tropical Marine Centre's Aquabeam 1000 HD Ultra Tiles. I'm reviewing those at present and they are very nice lights and appear to have much less red, blue, and orange than the Orphek. TMC, in tandem with Cree, tailored the newest Cree XR-E diode Kelvin temperature so as not too waste energy in the unneeded spectrum range. And, the TMC tiles do not use cooling fans. The Orphek has more color pop, but I prefer the ice blue look of the TMC tiles. I will be supplementing the three tiles with one of their Aquaray 600 marine blue strips which peak at 468nm. This will/should give me a little more color pop. If you need any more info on this system or the Orphek, just let me know. It is odd, yes. I know it used to work before because I've used it many times. Or, at least, I think I did. Getting older. Who knows for sure? I thought it worth reporting, anyhow. Sure makes it hard to search and not bug you for answers if the tool isn't working, don'tcha know. Thanks for the advice on the lights, James. I was unsure that one 24" light would provide enough punch to do anything. That's good news, though, because talking my wife into letting me spend $900 on lights is a whole lot easier than getting permission to spend $1800. Douglas should steer you right. 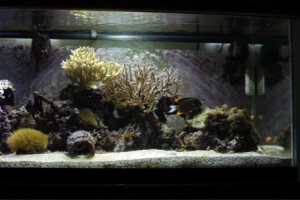 I'm pretty sure five of the Aquabeam 1000 HD Ultra Reef White tiles should light your tank nicely. They run 345.00 each at Dr. Tim's Aquatics. I'll definitely e-mail Douglas before pulling the trigger. I also want to look at your other recommendation. When do you think you'll post your review? I know the prices on these should come down in time, but can you pick up your crystal ball and speculate as to when they'll maybe drop under $600 for something like the PR-156W?